Discover how Smartsheet can help maximize your marketing efforts today. Successful marketing depends on planning. And using a marketing calendar provides numerous benefits beyond basic scheduling. A calendar can be used for all aspects of your marketing strategy: identifying your target audience, planning and goal setting, tracking resources, and more. Creating a comprehensive marketing calendar makes it easier to track goals and progress across marketing initiatives. You can see how different campaigns impact each other and schedule your budget for maximum effectiveness. An editorial marketing calendar can organize your content strategy, assign tasks to responsible parties, and ease the pressure of looming deadlines. Keeping track of product release dates, holiday promotions, and staff vacations can help you create appropriate content at the right times and avoid publishing gaps. Planning ahead can also lead to higher quality content by allowing adequate time for research and execution. Social media and email marketing can also be planned with a calendar to ensure that you’re engaging your audience consistently and effectively. Marketing calendar templates provide easy organization and a simple tool for collaboration, which can improve communication and ensure that projects stay on task. Below you’ll find tips on how to plan out your calendar and multiple marketing calendar templates, all of which are free to download. 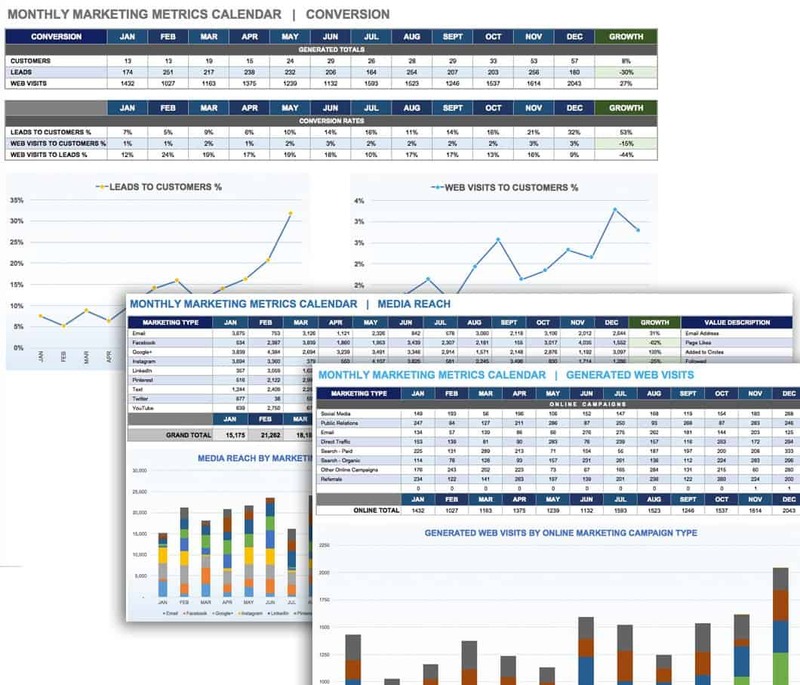 With multiple channels, competing priorities, and never-ending requests, leading marketers count on Smartsheet’s work management solutions to strategically plan, coordinate, and report on campaigns. Creating a marketing calendar may seem overwhelming, especially if you are planning content and other marketing efforts a year in advance. But the whole point of using a marketing calendar is to get organized, save time in the long run, and actually reduce stress. To help you with this process, here are a few things to keep in mind as you plan your calendar. Identify your target audience and adjust your marketing strategies to meet its changing needs. Developing a marketing strategy can provide some direction, but it’s all guesswork until a plan is actually implemented. Be prepared to adjust your tactics as you collect data from your customers. Use your content as a way of getting feedback from customers. What content is your audience responding to? Which channels are leading to sales? Use your publishing successes and failures to drive your marketing plan. Plan your calendar with your editorial team. Identify who is responsible for what content and how much content you can realistically produce. This is important even if you run a small business and generate all your own marketing content. There is no point in planning more than you can actually handle. If you are working with others, use your team to brainstorm topics and themes. Choose themes for your content based on customer questions or interest. Identifying themes can help you categorize topics and ensure that you’re producing a variety of content aimed at achieving specific goals, whether it’s generating leads, showcasing your expertise or selling products. Prioritize your content based on the intended result, and rotate your publishing schedule for different themes to make sure you are addressing a range of customer needs. Find keywords to optimize your content. Following best practices for search engine optimization (SEO) can help bring a wider audience to your content. Use a keyword research tool to look up what phrases people are searching for that relate to your topics. Include this information on your calendar along with meta-titles and other SEO tactics. Plan your calendar for up to 12 months out. Create a master calendar to work from and adjust it as needed. You may want to plan a more detailed calendar for each week or month, but having an overview for the year makes it easier to coordinate your marketing efforts, plan for holidays and important events, and ensure that your content aligns with your marketing goals. All of the templates shown here are in Microsoft Excel format and are free to download. Look through the marketing calendar samples to find the best template for you, then customize it if needed. 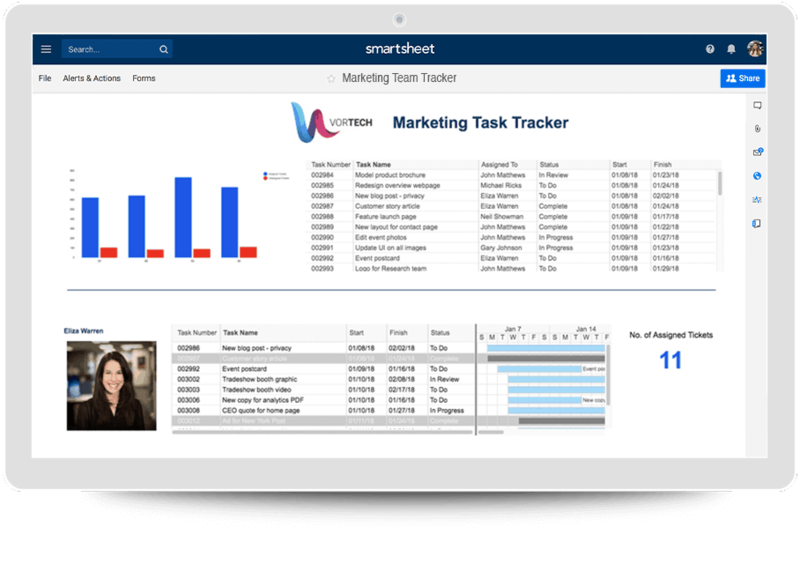 For a marketing calendar with greater functionality and collaboration, try Smartsheet, a real-time work execution platform that allows you to better manage and track marketing calendars, hit deadlines, and stay consistent across many marketing campaigns. This simple template provides a monthly calendar view with extra space to highlight important events, tasks, and deadlines. There is a section for planning ahead to the next month as well as notes. The format of this marketing calendar template lets you easily view your weekly schedule at a glance. This template is a good choice for printing and sharing because of the visual layout. This detailed marketing calendar template is designed for annual planning and also includes a snapshot of a single month. Goals can be clearly defined at the top of the template, while data on marketing effectiveness can be listed at the bottom. This template includes sections for sales, press releases, social media, email, online content, advertising, and more. Customize these fields as appropriate for your business, and track your progress weekly and monthly. 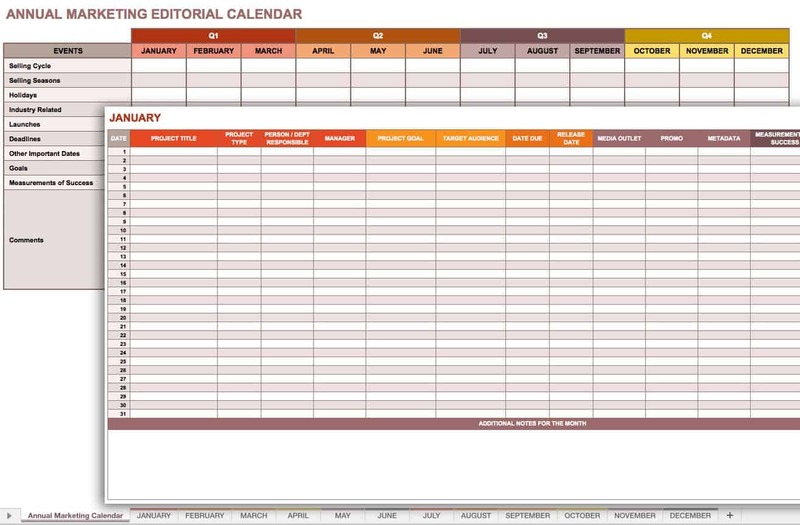 Highlights of this marketing editorial calendar include a yearly overview plus detailed worksheets for each month; space for coordinating content with business quarters and budget, holidays, product launches, and company goals; and essential editorial info such as type of content, author, target audience, distribution channels, SEO factors, and deadlines. This editorial template can help you schedule content far in advance, assign ownership for each item, measure the effectiveness of your marketing efforts, and adjust your content plan based on key metrics. 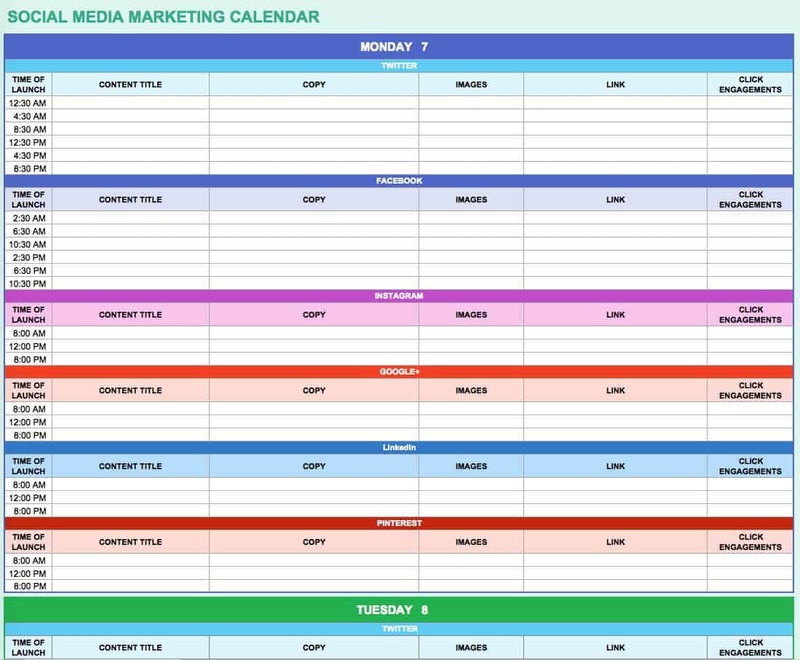 Social media is a vital tool for promoting content, and this calendar template makes planning easy. Use social media to collect information about how customers are responding to your content and which sites are sending you the most referrals. Then use your social media marketing calendar to ensure that you’re posting on the most effective outlets or have an equal presence across platforms. Social media planning also ensures that you won’t miss important dates or end up with holes in your content schedule. 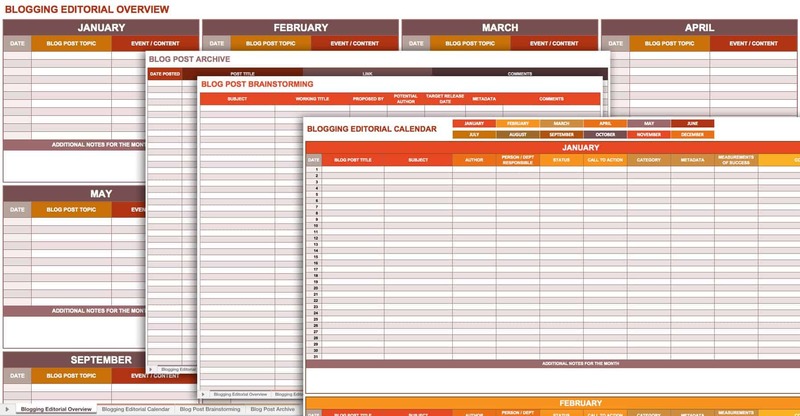 This editorial calendar template is designed specifically for blogging. The template provides an overview with important dates and a weekly schedule of blog posts. It also shows more detailed information, including author, status, call to action, keywords, and tags. Another worksheet provides space for brainstorming ideas and future planning. Manage your blog and create more consistent, effective content with an editorial template. This template is designed to help you organize content around multiple marketing campaigns. Enter the name, description, date, and status for each campaign and track the associated content or other marketing strategies. This marketing campaign calendar template provides an overview of all media and distribution channels, and which items have been published or completed for each campaign. Track your progress and build on your successes (or learn from your failures) with this monthly marketing metrics calendar. Collecting metrics will make it easy to create a monthly report and identify which channels are producing the best results. Especially for small business owners, this template is a handy tool for tracking goals and monthly performance. 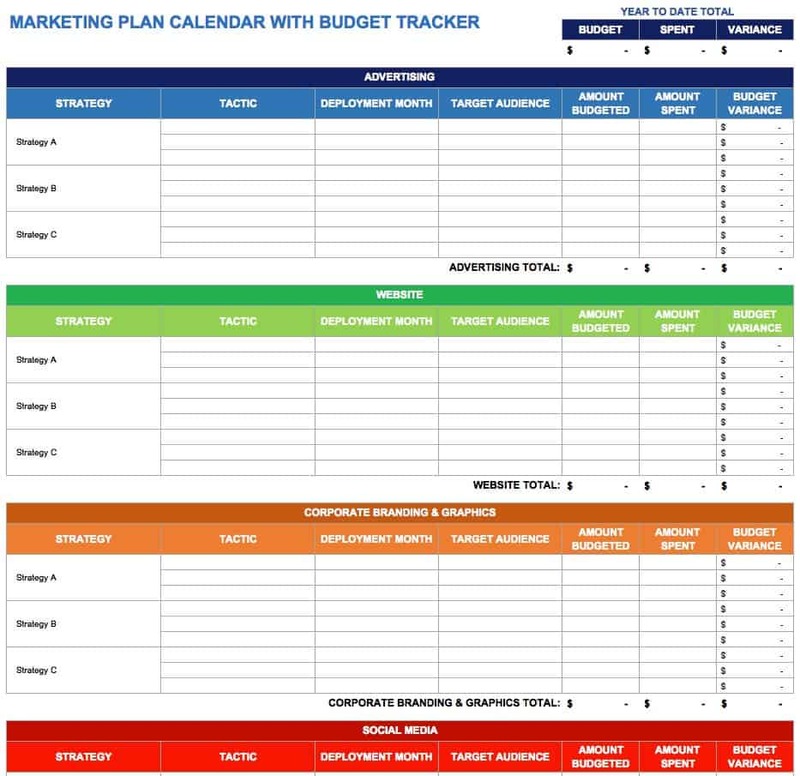 Use this marketing plan calendar template to outline your marketing strategies and action steps while keeping close track of your budget. This template shows the budget amount allocated for specific marketing tactics, the actual amount spent, and the budget variance. It also breaks down marketing strategies by category, including advertising, branding, public relations, social media, and more. Creating a strong marketing plan is the first step in ensuring the success of a new product or service, but managing your efforts and tracking your progress is just as important. To increase productivity and visibility, consider using a software tool that allows you to manage marketing campaigns on a visual timeline, organize campaign-specific details in one location, and track campaign progress, all in real-time. One such tool is Smartsheet, a work execution platform that enables enterprises and teams to get from idea to impact - fast. Extraordinary marketers rely on Smartsheet for campaign management, initiative tracking, content calendars, event management, and more. Use Smartsheet to boost accountability by maintaining consistency across channels and campaigns, save time with centralized resources, and increase campaign speed to market. Seamlessly connect marketing efforts to ROI, accelerate delivery of marketing initiatives, and improve alignment with internal and external stakeholders. Wauw. Amazing post crammed full with useful content. Thanks for the downloads! Hello. Thank you for Forms that was perfect. Thank you for Forms that was perfect. Thank you for supplying these forms. Very useful. Thank you for sharing. Thanks for these very useful materials! Been checking out your company via a friend's recommendation - you guys live up to expectations PLUS some! Great post - helps me get organized for the new year! Appreciate it! Great templates! Appreciate you posting them! Thank you so much for all the amazing spreadsheet templates!